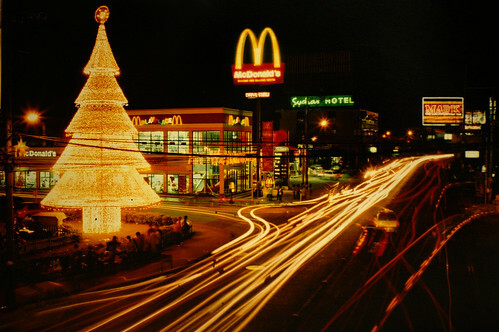 I’ve never seen a nice shot of Davao City at Night before. This one is perfect. Anyone familiar with Davao can tell that this is located in J.P. Laurel Avenue in Bajada, Davao City. The logo of McDonald’s has been emphasized even better. That’s the Sychar Hotel in Neon Green. And at the left is Victoria Plaza’s Christmas Tree that lights only during the Holiday Seasons. It’s beautiful indeed. Thanks for dropping by. And I like the theme of your blog. Keep blogging. I love the picture! Davao indeed is a busy metropolis.